When it breaks off, Chris Readinger, a physical scientist at the U.S. National Ice Center (NIC), said the iceberg will likely cover nearly 700 square miles, which equates to approximately twice the size of New York City. While this sounds huge, Readinger noted that the physical size of the iceberg isn’t really that spectacular if you look at the extended history of icebergs that dates back to the 1970s. For comparison's sake, the Delaware-sized iceberg (known as A-68) that broke off of the Larsen-C Ice Shelf in July of 2017, measured approximately 2,250 square miles. While the physical size of the potential iceberg isn’t especially remarkable, the crack’s proximity to the British Antarctic Survey Halley VI Research Station is concerning. In 2012 researchers noticed a previously dormant crack, known as Chasm 1, beginning to extend toward the McDonald Ice Rumples, explained Christopher Shuman, a glaciologist with NASA’s Cryospheric Sciences Laboratory. Then, on Oct. 31, 2016, glaciologists spotted what’s become known as the Halloween Crack on a part of the Brunt Ice Shelf that previously hadn’t shown signs of rifting or cracking. As a result, Halley VI Research Station was relocated further inland during the region’s 2016-17 summer season to avoid being cut off from the rest of the Brunt Ice Shelf. Although the station was designed to operate year-round, the British Antarctic Survey decided to close its doors for the 2019 winter season because of unpredictable conditions caused by the growing crack on the ice shelf. Chasm 1 has been extending approximately 33 feet per day for the last few weeks, according to Bert Wouters, an Earth scientist at Utrecht University in the Netherlands. Now, it’s only a matter of time before Chasm 1 extends just a few more miles and releases an iceberg from the shelf. 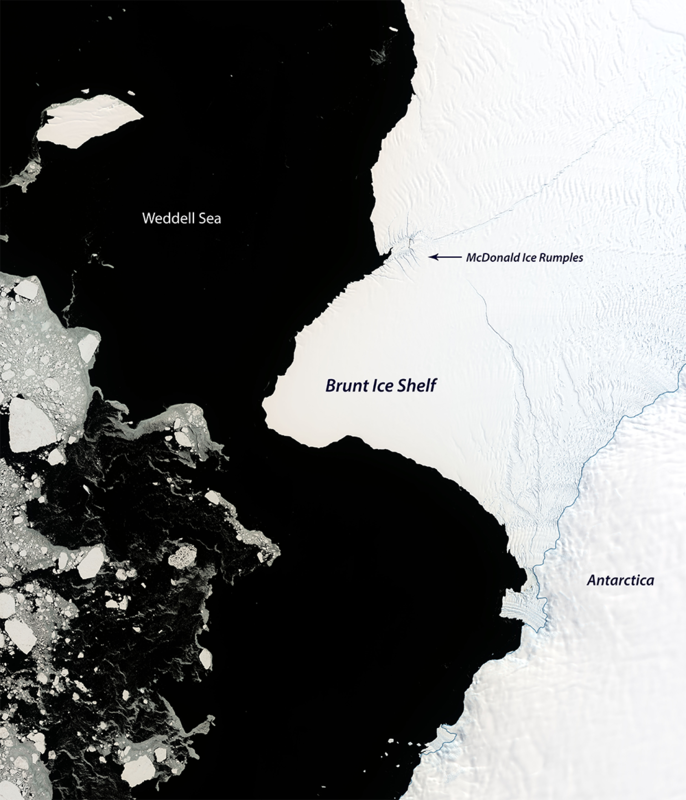 Once the calving event occurs, the fate of the remaining Brunt Ice Shelf is largely unknown. So while it’s difficult to predict how this could affect the overall health of the ice shelf, Readinger says the NIC has a pretty good idea of where the iceberg will go when it breaks off. Nearly 90 percent of an iceberg is actually below the surface of the water, so in a less exciting scenario, there’s always a chance it could get grounded or stuck on the ocean floor. 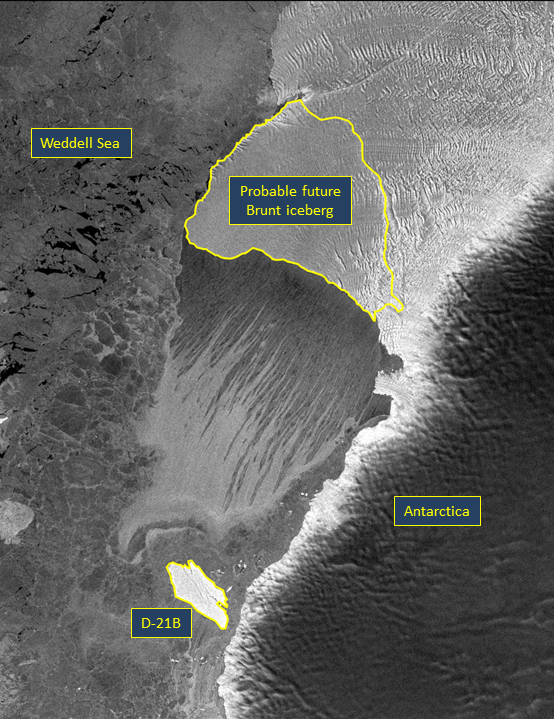 Regardless of what happens, Readinger said scientists at the NIC will be using satellite imagery to track the new iceberg as long as it measures at least 26 square miles. 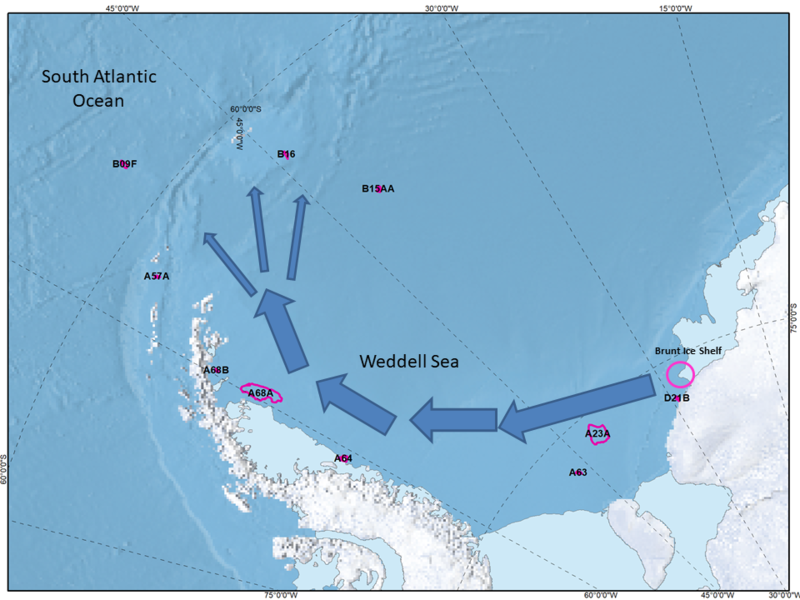 Currently, the NIC is tracking three named icebergs floating in the South Atlantic near Argentina so that cargo and passenger ships are aware of these potential hazards. Like all the others, this soon-to-be iceberg, the NIC will follow its whereabouts until it’s too small to be tracked. Then the remaining fragments will likely be tracked by South Atlantic countries like Argentina because they could still be considered hazardous for vessels in those waters.